Banana producers in Latin America will be subject to lower EU import tariffs as a result of the deal. This should make them more competitive with producers in Africa and the Caribbean, who pay no tariff. The price of bananas could fall by 12% as a result. The formal agreement will be signed in six to nine months' time. 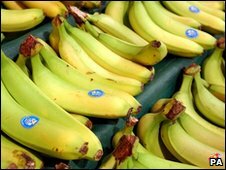 Duty on imported bananas will be cut from 176 euros (£158; $256) per tonne to an initial 148 euros (£133; $215). Further cuts will be made on an annual basis over the next seven years to 114 euros per tonne. The deal was being "initialled" in Geneva on Tuesday afternoon by the various trade representatives. "I am delighted that we have finally found a way to solve the bananas dispute with a compromise that works for all sides," said European Commission President José Manuel Barroso. "This is an important boost for the multilateral system". The agreement potentially brings to an end the banana wars trade dispute which began 16 years ago with the establishment of European tariffs on banana imports. But the origins of the discrepancy go back far further to European colonialism. In 1975 former Caribbean countries were given a generous import quota. The BBC's Europe business reporter Nigel Cassidy says the idea was to enable the economies of former European colonies or dependencies to grow independently without recourse to overseas aid. However, Latin American banana producers, together with the US, have long complained that the system is unfair. This view has been supported by the World Trade Organization (WTO), which has declared the banana tariffs illegal. Although not a banana producer itself, the US is home to some of the biggest banana producers operating in Latin America, including Del Monte and Dole. The move is likely to disadvantage the banana industries in Africa, the Caribbean and the Pacific (known as the ACP countries), who do not pay tariffs on imports to the EU. Many of them have economies heavily reliant on banana production, and rely on the EU tariffs to secure them access to the European market. Errol Emmanuel, acting manager of Dominica Banana Growers Limited, told the BBC World Service the agreement would hit poor farmers in the Windward Islands hardest: "These small farms are family owned. You have husband and wife and maybe one or two helpers... they don't have the resources to compete with the Doles and the Del Montes, who own vast tracts of land." A compensation package for Dominica and the other ACP countries, worth 200m euros, is included in the deal. The European banana market is the largest in the world, with 5.5 million tonnes of the fruit imported last year.